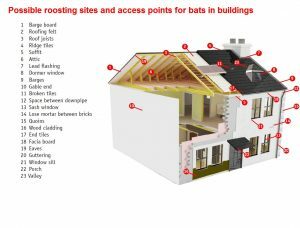 You are here: Home / Irish Bats / Bat Roosts / Why are bats in buildings? Bats typically roost in buildings in the warm summer months, between June and August, although they may be present earlier or later depending on the building and weather conditions. Nursery roosts (also known as maternity roosts), where mothers give birth and care for their babies, are the largest colonies. Each mother has one baby in late June or early July, which she suckles with her own milk. The number of bats in a nursery colony depends on the species of bat and how good the surrounding landscape is for providing insects. Female bats choose roosts that become very warm during the day because this increases the chance of survival for their babies. Non-breeding bats may occupy houses in smaller numbers, or even singly, and move around alot, rarely staying long in the same roost. During winter months, bats hibernate in cool places. In Ireland there is very little known about where bats hibernate in winter although summer roosts are not usually used. Houses are usually too warm so they may choose caves, bridges, crevices in stone-outbuildings, or even tree holes. in wall cracks (particularly in old outbuildings).